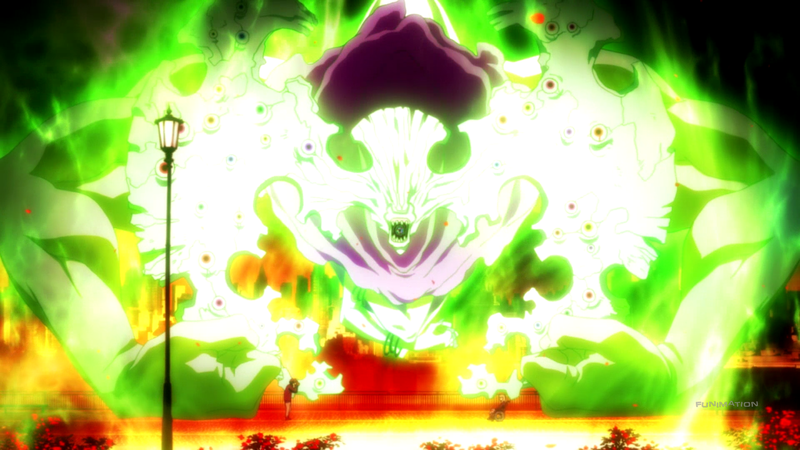 In Kekkai Sensen, a character goes by the name of White. She reminds me of my own sister since she also has a heart condition. Nothing serious, but it’s a condition she has had to deal with all her life. I remember one night when my sister went out to eat with her friends. She came home eventually; nothing out of the ordinary. Except, before heading off to bed, my sister let my father know of a pain in her chest. My father hesitated not, rushing her immediately to the hospital. So fast, in fact, that I did not realize where they went to until they got back. It turned out that my sister just had some heartburn, but it was still a scary moment for our family. I can only imagine how harrowing it was for her. I admire my sister for always dancing, always traveling, always living, despite her condition. Her heart may be weak, but it’s stronger in ways that I will never truly understand. Kekkai Sensen has heart, too. Not as strong a heart as my sister’s, but, as she proves, a weak heart isn’t the end of the world. Kekkai Sensen follows a teenage boy named Leonardo Watch. He arrives in Hellsalem’s Lot, a city filled with monsters, demons, and creatures that live (somewhat) peacefully alongside humans. A rather peculiar event (normal for Hellsalem’s Lot) grants Leonardo the chance to join Libra, a secretive group of elite fighters that protect said peace. At least, as best as they can. The anime seems fantastical, and, in practice, it is. Seeing a bunch of aliens fighting each other in an arena, an onion boy vying for hamburgers, or a pair of duelists playing an absurdly advanced game of chess can only appear in fantasy. 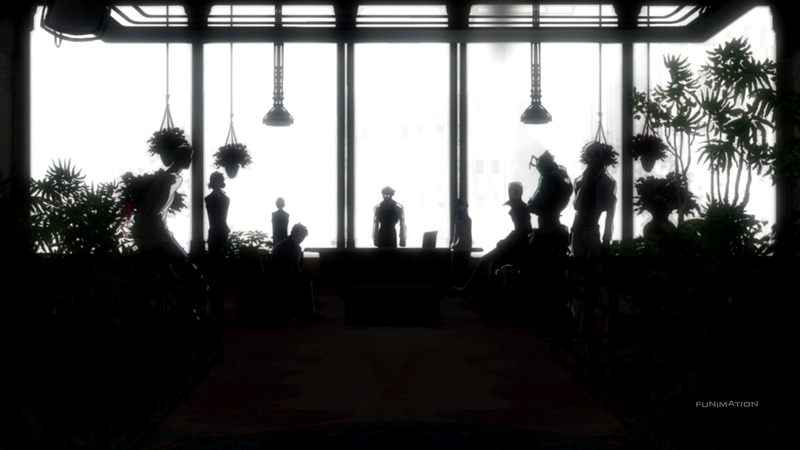 Despite the fantasy roots of the events within Kekkai Sensen, they feel rather realistic in their presentation. Those aliens are gambling on the fighters. The onion boy leads a lonely life. And the chess game, for all of its rules and difficulties, is still nothing more than a battle of the minds. It’s not fantasy or science-fiction or random. The anime takes its surrealism and underpins it with unbridled realism. “Realistic fantasy” is another way to put it. This realism is achieved through a lot of world-building. Acronyms and concepts are given quick, succinct definitions. The melting pot of characters creates bridges that introduce new ideas in a natural fashion. The episodic narrative portrays multiple areas and aspects of Hellsalem’s Lot. The episodic narrative is particularly interesting due to its two-fold approach. First, it gives the anime a slice-of-life feel, making the oft comedic material of the show feel right at home. Second, and most important, it grants Kekkai Sensen the chance to “reset.” By going episodic, the anime always gets the chance to try something new from what it did before. This onslaught of hodgepodge material, that never seem to be related to one another, reflects Hellsalem’s Lot beautifully. Now, in reality (meta joke intended), the anime puts emphasis on its overarching narrative which features its titular twins Black and White. Interestingly, it is not Leonardo’s quest to restore his sister’s eyesight that is most important – that quest is very rarely referenced beyond the first episode. No, it is Black and White’s tale of love and loss that means the most. Sadly, a couple of problems exist in the structure. For starters, it’s all a bit too obscure. For a large majority of the anime, little is given of the twins, what they are doing, and how their involvement plays into the bigger picture. The anime makes up for this quite a bit when it dedicates an entire episode to their upbringing, but, even then, the main events and details surrounding their involvement are still superficial. The biggest problem, not mentioned as such but mentioned all the same, is how it detracts from the main goal: Leonardo’s quest. Leonardo’s whole purpose of trekking to Hellsalem’s Lot, of joining Libra, of going through trials he has never experienced before, was to help his sister. More specifically, to restore her eyesight that he indirectly caused her to lose. The slice-of-life episodes already did next to nothing in this regard – indeed, being abducted by a psychopath and delivering pizzas does not yield (relevant) profitable results. But when the overarching narrative continues to ignore the original motivation, the main reason why this tale is being told to begin with, it makes Kekkai Sensen come off as unfocused. Distracted by the monsters and oddities it contains. Despite the distraction, the narrative as a whole has a theme that persists through both the episodic and overarching content. It’s not explored, so it’s not exactly deep. But it is an idea that most people can relate to: life is unpredictable. People usually have a plan for themselves. Who they want to be, where they want to go, and what they want to do. But life is a road filled with people and events which create potholes and forks and detours. In Hellsalem’s Lot, it is often taken to an extreme: getting visited by a god or having to evade a zombie apocalypse certainly create cracks in that road. But, as has been discussed, the anime is “realistic fantasy.” Missing out on lunch, resonating with a film, or losing loved ones are experiences that, while ranging in severity, are relatable while still skewing that road. But it’s not the unpredictable nature of life that matters most. It’s how one responds to those events that does. Never giving up, being there for another, and having hope. Taking it all in stride or sulking in defeat. Believing. These responses can be applied to those previous examples as well as throughout the whole season. Because each event is unpredictable, each event demands a response. And it is these responses that dictate where one goes down that ever-present road. Thus Kekkai Sensen delivers its message: Life is unpredictable – that’s the reality – but thinking one’s response does not matter is just pure fantasy. 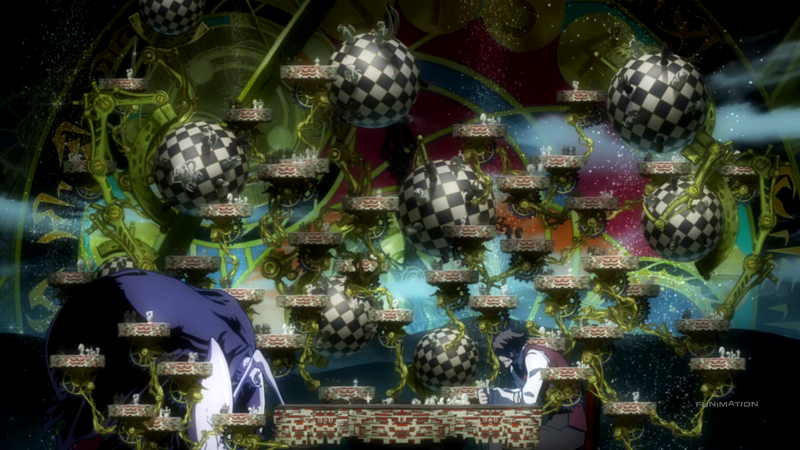 Perhaps Kekkai Sensen’s strongest part is, surprisingly, its art and animation. On an animation level, the anime does not (openly) cut corners. Almost every episode has some fight or brawl or massive movement that keeps Hellsalem’s Lot lively. A huge, metal contraption careening through the streets. A master with missing limbs battling a so-called Blood Breed who similarly lost body parts. A vampire getting sealed by the veterans of Libra. These examples are some of the more grandiose. Normally, the anime still holds up, characters acting appropriately with hair, facial, and nuanced movements. Crowds of moving people breathe life into the city. And background objects, such as a Ferris wheel or an airplane, make even the static scenes partially dynamic. On an artistic level, Kekkai Sensen performs even better. Of course, lighting plays a huge role in the visuals. Blue, orange, and red lights accentuate the abilities and moods of the characters and the situations respectively. The norm, however, has Hellsalem’s Lot draped in a dreary atmosphere. Cloudy skies, fogged locations, and gray lighting keep the crazy city, like its inhabitants, in a morally ambiguous spot. This dread contrasted with the more colorful parts is an added bonus. But the anime really shines in two subcategories of the art: the details and the cinematography. Despite Kekkai Sensen purposefully constraining itself to a single setting, the amount of areas that are visited are vast. A hospital, the Libra headquarters, a side street. The inside of a diner, an abandoned crypt, a grass-filled plain. Another dimension, atop floating debris, a highway traversing part of the city. The city alone looks detailed and crisp, but when every background and location has the same attention to detail, that sense of realism is ramped up that much further. The best, though, is the cinematography. 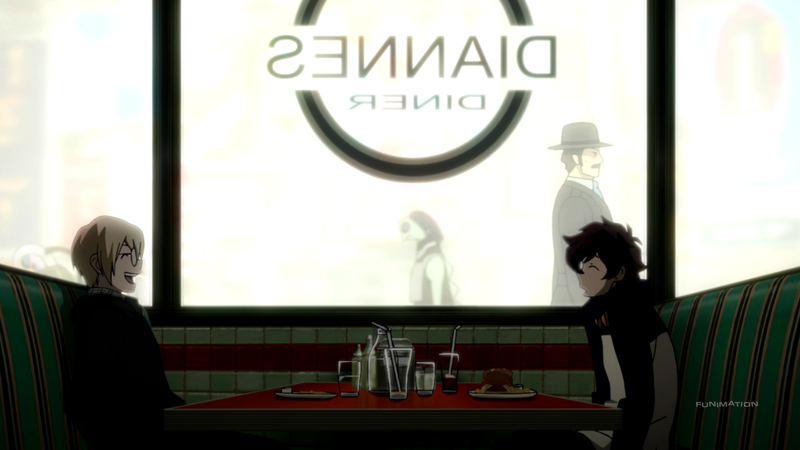 Kekkai Sensen likes to play with perspective, rotation, and closeness, creating shot after shot of coolness. Seeing through Leonardo’s eyes or a top-down view of the headquarters from the inside or a wide shot of Zapp versus his opponent make the anime a visual treat to watch. Finally, due to the nature of the anime, the character designs (for the actual cast as well as the background characters) are each creative and fun. Leonardo wears goggles for driving that also hint at what rests beneath his oft-shut eyes. Zapp’s all-white outfit and darker skin forms a dichotomy that matches his mean-yet-caring personality. And while Klaus’s red sideburns and fangs highlight the ferocious beast he can be, his glasses and suit create an air of importance that befit the gentleman. Kekkai Sensen’s cast is filled with people who are each a character. That reads like a redundant statement, but that’s what they are: characters. To clarify, they are not characters. They do not have complex conflicts. They do not have multiple sides to their personality. And they do not even have fully fleshed-out backstories. They are each a character, but they are by no means a character. Using examples makes this observation easier to see. Chain is a woman and a member of Libra. More importantly, she is a werewolf, granting her dexterity and quickness. Such skills she uses to tease Zapp, tricking him and literally standing on top of him, taking immense pleasure in doing so. That’s it. How she came to be a werewolf, whether or not her teasing hints at other feelings for Zapp, and what she thinks about herself and the situation does not get explored. She exists solely as a cute character who makes the audience laugh at her mistreatment of her friend. This same process can be applied to almost every character. Zapp is a jokester who is more caring than he first appears to be. Klaus is a lion-like leader who is cordial, determined, and powerful. Zed is a fish man who is respectful to everyone around him. Abrams is a master vampire hunter who reduces the luck of those around him. Gilbert the bandaged butler with wicked driving skills, K.K. the sniper (despite her eyepatch) who also has a crush on Klaus, and Dog the man-and-blood-beast hybrid. The cast are a bunch of characters, and that’s perfectly all right. Not only are there way too many to develop individually, but also it makes sense within the context of the anime. Hellsalem’s Lot is this hodgepodge of weirdos, so having the main cast be made up of a werewolf, a fish man, and a butler continues the motif already started by Kekkai Sensen. Interestingly, due to the nature of the narrative, Leonardo is the same. He is a regular, kind kid who just so happens to wield the All-Seeing Eyes of God (as the anime ordains them). To be fair, he gets a bit more than the rest of Libra. The story molds him into a brave, confident kid who has clearly grown beyond being the weak, scared kid he was at the beginning. But, to reiterate, the narrative does not focus on his main goal of helping his sister. Meaning, such bravery and confidence does not mean a whole lot when the bigger picture is looked at. The question, then, becomes a simple one: Who is not just a character but instead a character? The narrative makes this clear once more: Black and White are arguably the main characters of the anime and thus are actual characters. Their names alone provide a lot of symbolism. They are twins, Black a boy and White a girl. Black grew up with psychic powers rivaling the best of them, and White grew up without psychic powers, a “failure” in her lineage. Ironically, Black tended to be weak-willed, a crybaby of sorts, whereas White tended to be mature for her age. But they grow up together. They get bullied, they look out for each other, and they come to the conclusion that they cannot live without one another. Not in a physical sense but in a philosophical sense. All of these details are given quite later on. (Episode eleven to be exact.) Preceding them are a different Black and White. Black seems possessed by a dark entity, masquerading as the boy in order to enact some evil scheme he has been concocting behind the scenes. White finds herself in the hospital, dealing with a heart condition that keeps her confined and irritable. The reason for their turn of fates is pieced together through more flashback. During the calamity that spawned Hellsalem’s Lot, Black and White are visited by the King of Despair. Black sacrifices himself, letting the spirit take his body on the condition that he does not harm White. Despite his valor, White dies. (It’s a bit unclear how.) Her parents, who likewise are near their doom, use the last of their powers to “resurrect” White, turning her heart (and, by extension, her whole body) into a piece of the barrier protecting the city. What’s cool is that this series of events is designed to mirror Leonardo’s. Leonardo and his sister were visited by an all-powerful entity, she sacrificed herself for him, and Leonardo seeks to help her out in whatever way he can. Sadly, this parallel means little since little is done with it, but it’s interesting nonetheless. Of course, everything goes wrong. White does indeed betray Leonardo, Black later “kills” White, and a second calamity is about to occur. But thanks to Leonardo and some deus ex machina, White comes back to sacrifice herself, removing the King of Despair from Black and reestablishing the barrier. So Black and White are characters. They have a beginning, a middle, and an end. That is, they go through an entire arc over the course of the season. The next step is what these arcs did for them. I.e., how did they develop over the course of the anime? In White’s case, some development is seen. She protects Black after failing to do so multiple times before – the anime has a nice parallel with this saving scene and the one from her childhood. She also opened up to Leonardo, a person other than her brother. She does betray him, but she at least admits the mistake she made (even if that immediate turnaround is a little silly). In Black’s case, it’s a bit more complicated. His action to sacrifice himself for his sister demonstrates that he, however slightly, overcame the cowardice he had when he was younger. But the crux of his character focuses on the demon possessing him. To put it differently, he does not have a conflict that he deals with personally over the course of the season. Black worries about White and befriends Leonardo, but the events that unfold do not seem to directly affect or influence him. Instead, they focus mostly on the King of Despair being this evil, nonchalant antagonist. His final conversation with White echoes the same sentiment they had all along: a world without her is not a world worth living in. That line makes sense for his character, but, since he never seems to fight for her, never seems to do whatever he can while possessed by the King of Despair, his echoing rings hollow. So while Black and White are characters, they are not particularly impressive. Still, the other lovable troupe of characters help to make Kekkai Sensen the strange anime that it set out to be. If Kekkai Sensen is remembered for anything, it will be its ending track. The ED is, in short, a big bundle of fun. Bass strings, hard guitar, and nice vocal work come together to create a dance number that gets one grooving. The changing tempo, the other instruments, and even just the name of the song – “Sugar Song to Bitter Step” – make the entire piece a joy to listen to. It’s one half cool, one half smiles, and wholly awesome. The opening track is as well done, if not better than, the ED. It starts off quick yet reserved, the low tone and soft-speaking singer continuing for a portion of the piece. By the halfway mark, the instruments and the vocalist pick up, the track becoming more frantic and passionate in tone. As the end approaches, the OP builds and builds on itself until a triumph is reached. It’s an empowering song that follows the flow of Kekkai Sensen, making it just as welcome of an addition as the ED is. All of this to get at a single idea: like the story and the characters, the music is a hodgepodge of different beats, tones, and compositions, creating an amalgamation of sound that not only fits the anime but also is pleasant to hear outside of it. Also, a shout-out to the reverberating sound-effect whenever Leonardo used his eyes. It gave his power a powerful feeling, the blueness and otherworldly vision notwithstanding. The only miss in the sound department is the voice acting. To be fair, it’s more a mix than a miss, but it’s certainly a step down from the rest of the music. On the one hand, Daisuke Sakaguchi as Leonardo does a nice job, using a voice that works for the growing-up boy. On the other hand, Rie Kugimiya as Black uses a voice that is a tad bit too effeminate. Everyone else falls somewhere in-between. For those that do not know, this anime has a slightly strange history. Here’s the short of it: The last episode got delayed. And delayed. And delayed. To the point that questioning if the season would ever officially end became a joke itself. Granted my timing is even worse when I see that I am completing this anime literally more than a year after I started it. Regardless, getting to go from the second-to-last episode to the last one, while knowing that so many people waited months, made me feel oddly privileged. As for the final episode itself, it was okay, neither momentous nor horrendous. It certainly had scale, considering that the city was about to blow up again. But I can’t say it’s one of my favorites. For me, my favorite episode happens to be the eighth one for a single moment. Allow me to explain. Much of the episode revolved around Zapp being a lazy, promiscuous, and incompetent dude. So, of course, he gets tasked by his master to take care of this egg enemy: Attack each of its eyes simultaneously lest he risk a limb or two. But, as was shown, there is no way he can do it because he’s, well, Zapp. Cue Chain receiving a phone call from her lady friend that Zapp tried to flirt with earlier in the episode. Said lady friend essentially wants to get in Zapp’s pants. Upon hearing such news, Zapp channels his inner focus. A hawk screeches, a water droplet falls, and the sun peeks out over the Earth’s horizon. Zapp succeeds with ease, his reddened crotch on the infrared scanner indicating his motivator. Only the phone call was fake, a ruse to spur him forward. And all the while Zapp has his goofy, big belly from his numerous days of debauchery. I remember pausing the episode from laughing so much at this wonderful and clever joke. I even went so far as to mark it down in my notes for this review later on. That’s how much I liked it. That joke was the high for me. Of course, there were some lows. The material on Black and White (the last quarter or so of the season), while more in-depth compared to everything else, was not as fun or engaging. I wish Dog had more of a role in the show. I would have liked to see the potential romance between Leonardo and White progress further than it did. Not everything else was a low, though. The cast was fun and the comedy made me laugh. Chain’s interactions with Zapp always made me smile. There were cool moments like when they fought the Blood Breeds in the underground or Leonardo being an awesome friend with the hamburger kid. Overall, I liked the show. Not a whole bunch, but it was definitely entertaining. Kekkai Sensen ends up better than expected. It does a lot right with its art and its music. It falters slightly with its story and its characters. And it can be both fun and frustrating to watch. Its heart was in the right place, but the execution just wasn’t quite there. This was definitely an anime that would have been well-served by having more episodes to tell its story with. It still manages to be one of my personal favourites though—party because I’m an absolute sucker for nonlinear storytelling—but mostly because of Matsumoto Rie, who is little-known by anime fans yet one of my favourite directors in the industry. The details and nuance she packs into each shot is ridiculous, and she works with a very high degree of economy, one of the only reasons that Kekkai Sensen could be told as well as it was in only 10 episodes. Anyone who’s seen Kyousougiga should recognize her mark on Kekkai Sensen, and the two make an interesting study in comparison. I had a pretty ideal Kekkai Sensen experience, unlike many viewers (I waited until after the show was finished before watching), and even then I was impressed by the extra details I noticed when I rewatched it with my brother. I’m hoping that she continues to get original series to work on for herself. I think she could work absolute magic on a two-cour show. > This was definitely an anime that would have been well-served by having more episodes to tell its story with. It’s almost weird that it *didn’t*. Mostly because a slice-of-life-esque anime like this can more or less make as many episodes as they want. Even more so when everything is so fantastical that they can basically do whatever they want. I am a fan of that style, too, if only because it makes following and understanding more complex and thus more interesting. I have to get around to Kyousougiga someday. I keep hearing wonderful things about it, but, because I am so backed up on anime and time, it will be a long while until that I can do so. > …and even then I was impressed by the extra details I noticed when I rewatched it with my brother. My younger brother does not watch NEARLY as much anime as I do, so I am a bit jealous that you get to watch anime with him! > I think she could work absolute magic on a two-cour show. I’ll be sure to keep an eye out on Ms. Rie in the future. Despite my qualms with the structure and direction of KS, it still has a lot ideas and magic packed into it that indicate much care and attention. And you pulled through. I didn’t doubt you! > My younger brother does not watch NEARLY as much anime as I do, so I am a bit jealous that you get to watch anime with him! > I’ll be sure to keep an eye out on Ms. Rie in the future. Despite my qualms with the structure and direction of KS, it still has a lot ideas and magic packed into it that indicate much care and attention. I won’t say she’s a director with the visual or symbolic density of Yuri Kuma Arashi’s Ikuhara, but I think she has a better sense for a comedic beat and a fine sense of how to develop character. White and Black, your favourite characters of Kekkai Sensen, were actually anime-original content. I suspect that their excellent handling was due to her (and whoever wrote that scenario, of course). Any of those are fine, or even just Ambi if you want to save on typing. 🙂 And I’ll be around—I’ve been a subscriber for a while, but I think I’ll try to comment more regularly from now on. It looks like your comment got posted twice! From what I can tell, it’s because of a name change. I approved it because I wanted to approve your other comment you made in reply. Let me know if you want me to delete the above comment, Ambiguous! It might have been the name change, but I also forgot my login details the first time I posted—and then I thought the comment hadn’t been submitted and submitted it again, and changed my username to the one I use elsewhere while I was at it…I actually thought this might happen, so my bad 😛 You’ve commented on both, so might as well leave them! > You’ve commented on both, so might as well leave them!